The Model 1100C series power potentiostat/galvanostat is designed for electrochemical applications that require relatively large current and high compliance voltage, such as battery studies, corrosion, electrolysis, and electroplating. The potential control range is ±10 V, the current range is ±2 A, and the compliance voltage is ±25 V. The instrument contains a high speed digital function generator, a fast data acquisition system, current signal filters, iR compensation circuitry, a potentiostat, and a galvanostat (1140C only). The function generator can update at a 10 MHz rate, and the maximum sampling rate is 1 MHz at 16-bit resolution. The 1100C series is capable of measuring current down to tens of picoamperes. The steady state current of a 10 μm disk electrode can be readily measured without external adapters. The instrument provides a very wide dynamic range of experimental time scales. 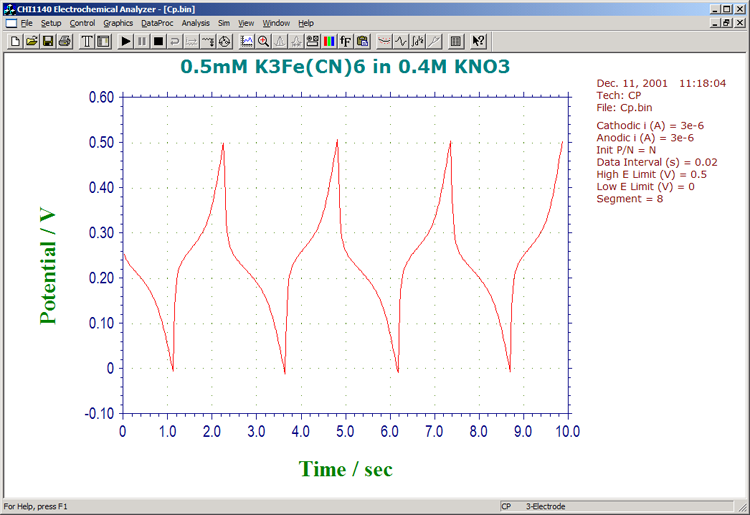 For instance, the scan rate in cyclic voltammetry can be up to 1000 V/s with a 0.1 mV potential increment, or 5000 V/s with a 1 mV potential increment. The potentiostat/galvanostat uses a 4-electrode configuration, allowing it to be used for liquid/liquid interface measurements and eliminating the effect of the contact resistance of connectors and relays for high current measurements. The data acquisition systems allow an external input signal (such as spectroscopic) to be recorded simultaneously with electrochemical data. The model 1100C series is the latest upgrade to our model 1100 series. The major improvement is very stable and accurate potential control. The 1100C series has a USB port (default) and a serial port for data communication with the PC. You can select either USB or serial (but not both) by changing a switch setting on the rear panel of the instrument. 16-bit highly stable bias circuitry has been added for current or potential bias. This allows wider dynamic range in AC measurements. It can also be used to re-zero the DC current output. We provide several different models in the 1100C series. The following table compares the different models. Other than what is listed, the specifications and features of these models are identical. Models 1100C/1110C are basic models, while Model 1140C is a more advanced model with a galvanostat. Model 1100C Series Specifications - for older series (1100A, etc. ), contact us. #: Corresponding polarographic mode can be performed. &: Corresponding stripping mode can be performed.